RO will call hits on slug gong 1 and rifle gong 1-6. One hit to neutralize rifle gong 1-6 and slug gong 1. 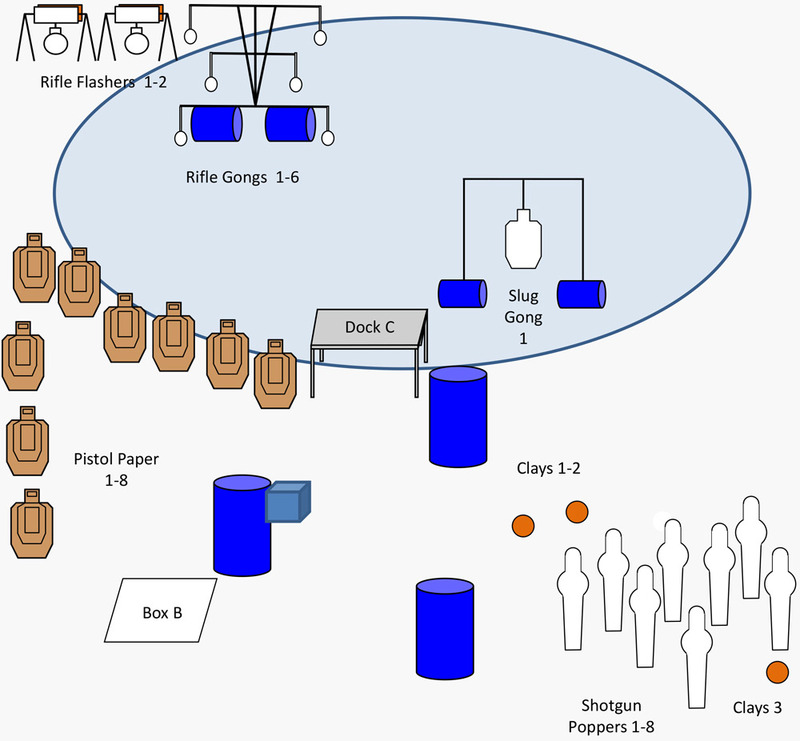 Be sure to tell RO your planned order of engagement on rifle gong 1-6 and rifle flasher 1-2. RO will call hits on Long Range Rifle Target. RO may call hits on turned shotgun plates. One hit only on rifle flasher 1 to neutralize target. Upon start signal engage rifle paper 1-4 and rifle flasher. Note: Do not move past rifle dump barrel to engage rifle targets. Ground safe or empty rifle in rifle dump barrel. Retrieve shotgun and engage shotgun plates 1-29. RO will call hit on rifle flasher. RO will call hits on rifle gong 1-6. RO may call hits on turned shotgun/pistol plates. 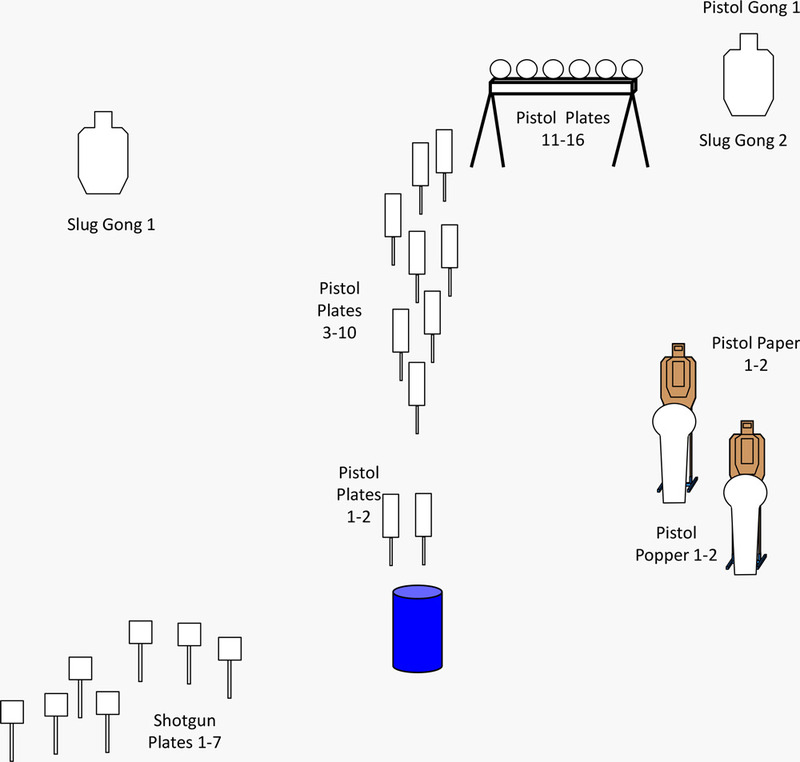 One hit only on rifle gong 1-6 to neutralize target. 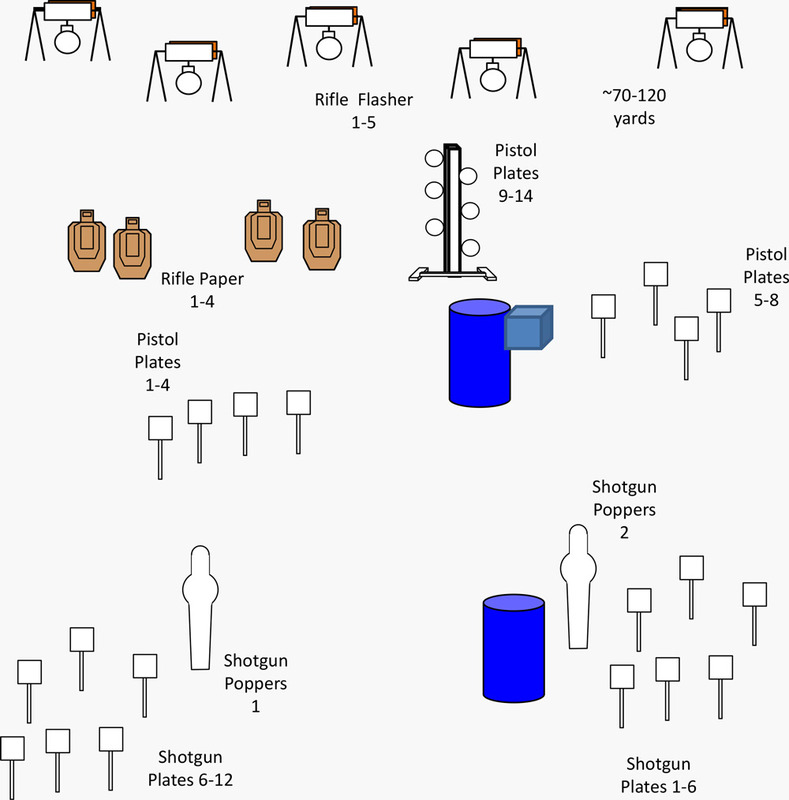 Upon start signal engage shotgun poppers 1-2 and shotgun plates 1-9 with shotgun. Ground safe or empty shotgun in shotgun dump barrel. 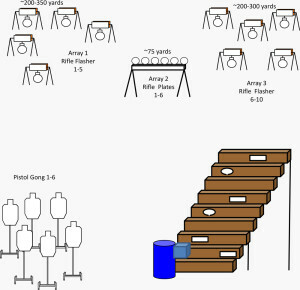 Once you have put both feet on the platform draw pistol and engage pistol paper 1-4 and pistol plates 1-5. Note: Pistol may not be drawn until both feet are on platform. The stairs are not part of the platform. Ground safe or empty handgun into pistol dump bucket. 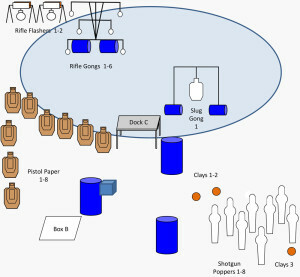 Retrieve rifle and from the platform engage rifle steel 1-6. RO will call hits on rifle. RO will call hits on rifle flasher 1-5. RO may call hits on turned shotgun/pistol plates. One hit each required to neutralize rifle flasher 1-5. Upon start signal engage shotgun poppers 1-2 and shotgun plates 1-12 with shotgun. Ground safe or empty shotgun in shotgun dump barrel. 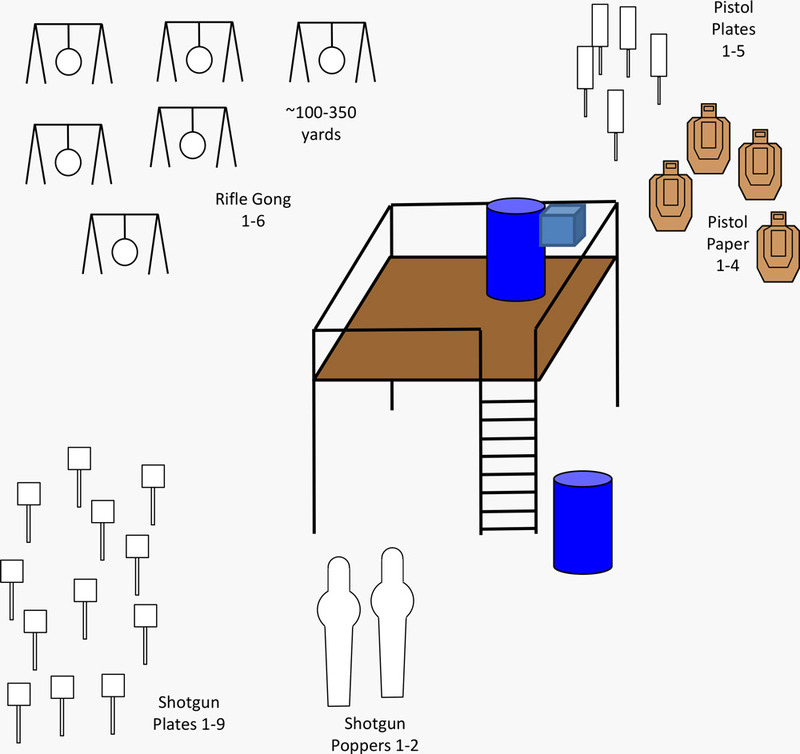 Draw pistol and engage pistol plates 1-8 and dueling tree. Note: Call your own hits on dueling tree. You may not move past pistol dump barrel to engage pistol targets. Ground safe or empty handgun into pistol dump bucket. Retrieve rifle and engage rifle steel 1-5 and rifle paper 1-4. Do not move past fault line for rifle. RO will call hits on rifle. Starting with foot on start line handgun loaded and holstered and hands on head. RO will call hits on long range rifle targets and C-Zone pistol gongs. 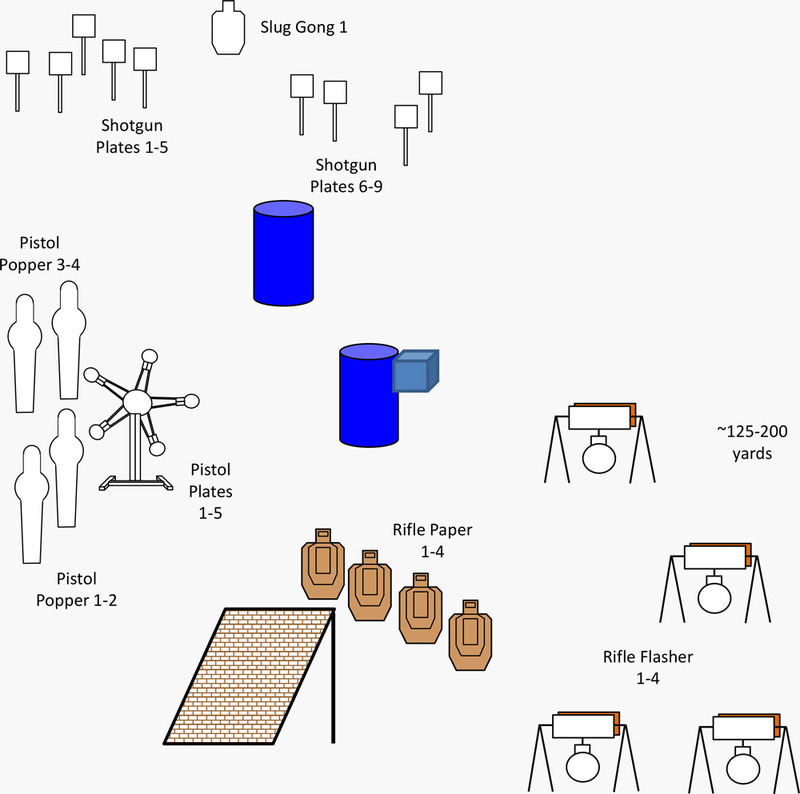 Long range rifle targets and C-Zone pistol gongs require one hit each to neutralize the target. Rifle plates must fall. 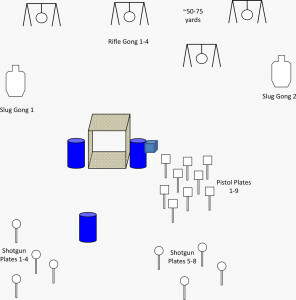 Upon start signal draw pistol and engage pistol steel 1-6 with one shot each. Ground safe or empty handgun into pistol dump bucket. Retrieve rifle and engage rifle plate rack 1-6 and rifle flasher 1-10. You must take one array of choice from the ground and one array each from two different ports through the stairway. While on the ground you cannot support off stairwell. While on the stairs no part of your body may touch the ground. There will be a procedural assessed per target if you don’t change ports on stairwell. RO will call hits on rifle. RO will call hits on rifle gong 1-3. One hit required on rifle gong 1-3 to neutralize target. RO may call hits on turned shotgun/pistol plates. Upon start signal engage shotgun plates 1-12 with shotgun. Ground safe or empty shotgun in shotgun dump barrel. Once shotgun is safely grounded breach door with feet only. Enter the door and draw pistol. 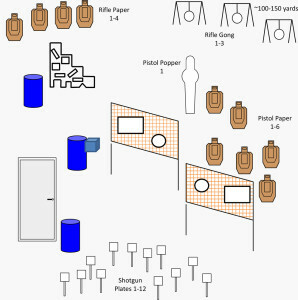 Engage pistol paper 1-6 and pistol popper through ports in wall. Note: Pistol may not be drawn until door is breached. Ground safe or empty handgun into pistol dump bucket. Retrieve rifle and engage rifle paper 1-4 and rifle flashers 1-3. Rifle must be in contact with barricade while engaging rifle flasher 1-3. RO will call hits on rifle. RO will call hits on slug gong 1-2 & pistol gong 1. RO may call hits on turned shotgun/pistol plates. One hit each required to neutralize slug gong 1-2 and pistol gong 1. Upon start signal engage shotgun plates 1-7 and shotgun slug 1-2. Ground safe or empty shotgun in shotgun dump barrel. Draw pistol and engage pistol paper 1-2 and all pistol steel. Do not go past final fault line to engage plate rack and B/C zone with pistol. RO will call hits on shotgun slugs and pistol B/C zone. RO may call hits on turned shotgun/pistol plates. RO will call hits on rifle flasher 1-4. One hit only required to neutralize rifle flasher 1-4. Upon start signal engage shotgun plates 1-9, and slug with shotgun. Ground safe or empty shotgun in shotgun dump barrel. Draw pistol and engage pistol poppers 1-4 and pistol star. Note: Pistol may not be drawn until between the barrels and you may not advance past dump barrels. Ground safe or empty handgun into pistol dump bucket. Retrieve rifle and engage rifle paper 1-4 and from the rooftop engage rifle flashers 1-4. 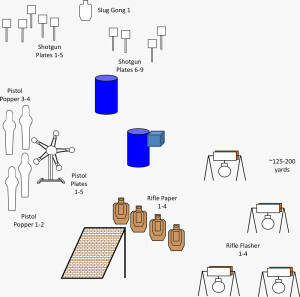 No part of the competitor’s body may touch the ground while engaging rifle flashers 1-4. RO will call hits on rifle and shotgun slug. RO will call hits on rifle gong 1-4. One hit each required on rifle gong 1-4 to neutralize. RO may call hits on turned shotgun/pistol plates. 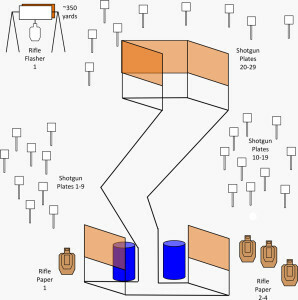 Upon start signal engage shotgun plates 1-9 and slug 1-2 with shotgun. Ground safe or empty shotgun in shotgun dump barrel. You may not pass the shotgun dump barrel to engage slugs. 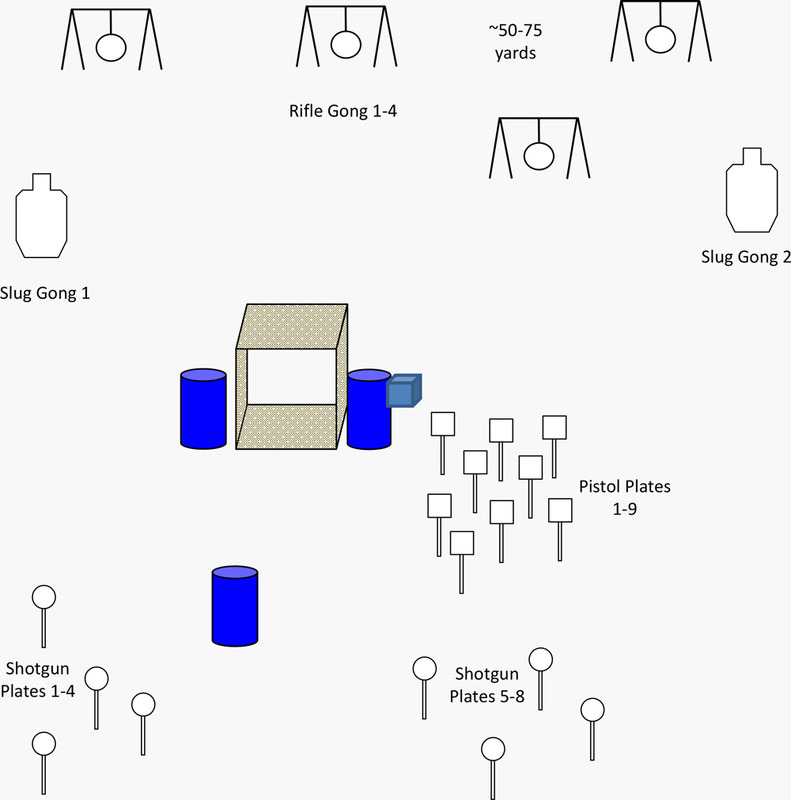 Draw pistol and engage pistol plates 1-9. Ground safe or empty handgun into pistol dump bucket. Retrieve rifle and from outside the hunting blind engage rifle flasher 1-4. Enter the blind and reengage rifle flasher 1-4. RO will call hits on rifle and shotgun slugs. © 2019 Generation III Gun. All rights Reserved.